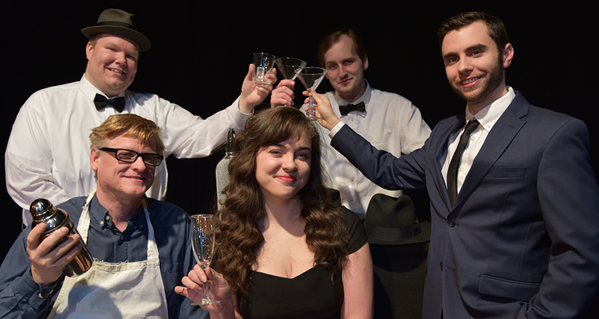 “The Rat Pack Lounge,” currently playing at the Round Barn Theatre, kind of combines “Heaven Can Wait” with “Damn Yankees.” Three seemingly saved souls with a mission to fulfill temporarily occupy another’s body only to find themselves face to face with a Faustian bargain. And that’s what may give this show a lift above most “Jukebox Musicals.” We not only get one unforgettable song after another, but there’s also a plot involving real growth in the characters. That and the fact we’re talking about three stalwarts of the famed Rat Pack here. Vic Candelino (Greg Matzker) has inherited the failing dive known as “The Rat Pack Lounge.” Decades earlier Frank Sinatra made a careless promise, while waiting for his bus to be repaired, that he and his companions Sammy Davis, Jr., and Dean Martin, would one day return. As the show opens God reminds the three that, as thankful as he is for a few recent favors they’ve done for him in heaven, he is the real Chairman of the Board. Not only that, as a result of their careless and unfulfilled promise Candelino is about to end his life. It’s up to them to stop this from happening or they’ll end up in a warmer climate -- and God is not talking about Vegas. This premise allows our three central characters to portray the mannerisms, style, and stylings of the three musical legends without actors Max Mattox, Jake DuVall-Early, and Bradley Keiper having to look in the least like Frank Sinatra, Sammy Davis, Jr., and Dean Martin. DuVall-Early might have the toughest task -- transforming from the white janitor Bobby Goldberg who mops up at the Rat Pack Lounge into the original Candyman who sings “What Kind of Fool Am I?” That latter number is a tour-de-force, as DuVall-Early channels Sammy Davis Jr., singing the song as Ethel Merman, Bette Davis, Jimmy Stewart, James Cagney and Sean Connery among many others. DuVall-Early shines here and throughout the show. Max Mattox plays the real estate baron William Saunders, passed out at the bar, who is inhabited by Frank Sinatra’s spirit. I hadn’t thought about the song “High Hopes” in the longest time, but that just might be my favorite song by Sinatra. It was Sinatra who made the thoughtless promise that is the premise of the show, and Sinatra who faces the temptation to make a deal with the devil for eternal fame against redemption. Mattox happily pulls off this twisted plot device! One of the happiest decisions of the writers was to give the iconic “My Way” not to the Sinatra character, but to Candelino. Matzker manages to initially sing it painfully poorly but later with authenticity as he teaches us that life is for living. There’s an everyman quality to Matzker’s portrayal that is honest and endearing. Randa Meierhenry, who graced the Round Barn stage last season, is back as the angelic Angie, who keeps the boys on track. She’s responsible for my two favorite numbers in the show, “Too Close for Comfort,” and “Fever,” mostly because she’s that good. One reason the show works so well is Musical Director Paul Rigano’s heavenly live accompaniment on the theatre’s new vintage baby grand piano. Meierhenry’s lighting design is one of the most effective of the past few seasons at the Round Barn. Richard Pletcher’s set design makes the most of the dimensions of the Joseph Stein stage and is especially effective with regards to the transformation of the Rat Pack Lounge during the intermission. Artistic Director Amber Burgess doubled -- or tripled -- as Director and Choreographer and thanks to her the show is in constant motion without the movement proving distracting. Her choreography for “Angel Said” gives the impression of a large production number with only four actors. That’s worth celebrating. When I was seventeen the Rat Pack had been around forever and it seemed as if they’d always be there. “The Rat Pack Lounge” demonstrates that the songs have lasting power, especially when they come alive through this talented cast and crew. The Rat Pack Lounge, Written by James Hindman and Ray Roderick, Musical Arrangements by John Glaudini. At the Round Barn Theatre at Amish Acres through May 20. For reservations and information call 800-800-4942 or go to www.amishacres.com.